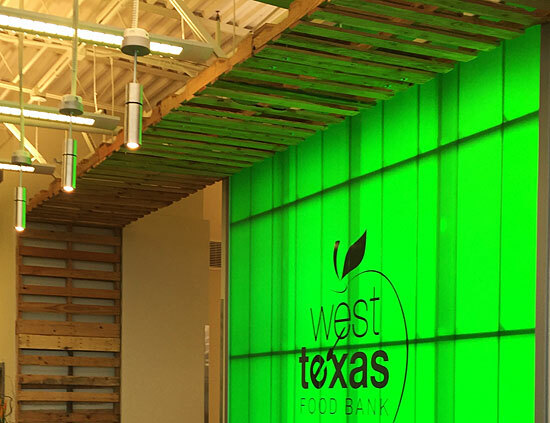 Earlier this year I reported on the grand opening of the West Texas Food Bank's main facility in Odessa. That facility - the crown jewel of the Food Bank's physical presence - was the first result of a $13 million capital campaign (an amount raised in only 13 months). The second step was revealed last night, when a sneak preview grand opening (the official public grand opening is this morning) was held at the new Midland location - the official name is the "Midland Community & Volunteer Center" - the first physical presence of the Food Bank in our city. Debbie and I were once again privileged to attend, and I wanted to share some photos from this great addition Midland's benevolence infrastructure. The new facility is located at 1601 Westcliff Drive, just south of the Andrews Highway, near the Midland County Tax Offices. The main building is a repurposed existing structure that was donated by Mike and Cindy Black and Lea and Melanie Crump (the lobby bears their names). It's only about a third of the size of the Odessa location, which is 60,000 square feet, but it purposes are a bit different and don't require the same scale. 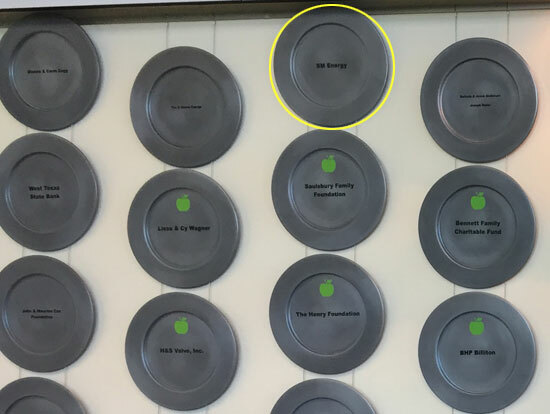 The lobby shares some features of the Odessa facility, including the striking green logo wall, and the installation of dinner plates showing the names of the donors who made these facilities possible. A unique aspect of the Midland location is the integration of actual wooden food pallets as an architectural feature, as shown below. Here's a sample of some of the donor plates mentioned above. I felt compelled to highlight the plate belonging to Debbie's and my employer, SM Energy Company. Immediately off the lobby is the H-E-B Client Choice Pantry, where clients can "shop" for an assortment of food, both fresh and non-perishable. 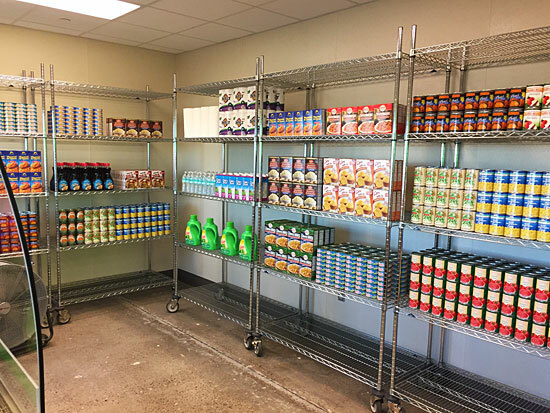 This pantry will be stocked with items specifically geared toward the nutritional needs of senior adults. 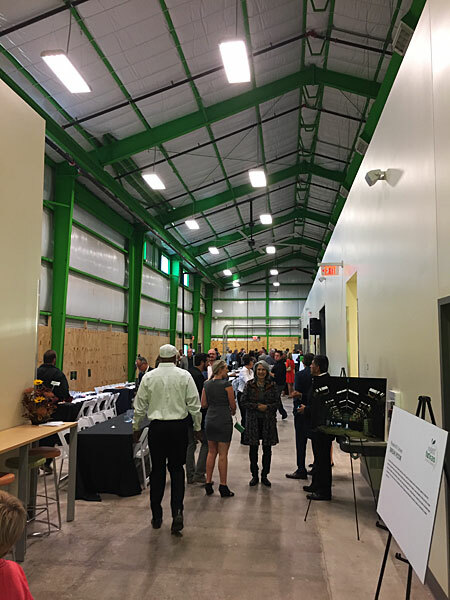 H-E-B is a major donor, giving generously of both finances and food, and at the event last night their spokesman surprised the crowd with an additional $25,000 pledge. Moving further into the facility, you come to the Wayne & Jo Ann Moore Charitable Foundation Volunteer Center. This is where the work of unloading, inspecting, processing, sorting, and boxing donated food takes place...primarily by community volunteers. 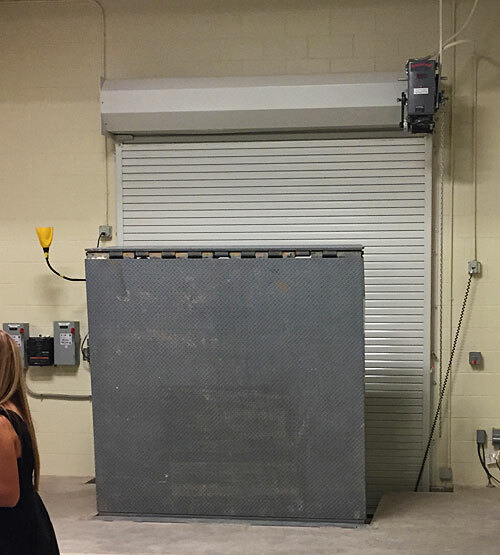 It is equipped with a loading dock; a "cold processing room" for inspecting meat, dairy, produce, and eggs; and a "sorting and isolation room" for storing and sorting non-perishable items. 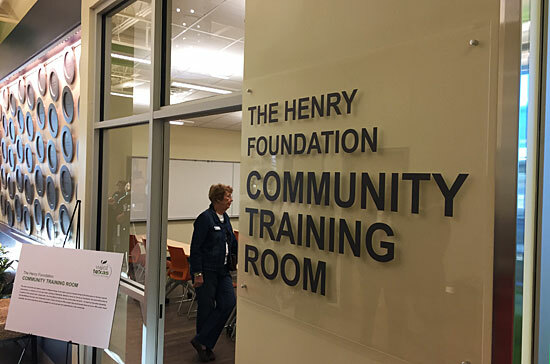 Moving to the other end of the building, you find the administrative offices, the Bobby & Leona Cox Demonstration Kitchen, and the Henry Foundation Community Training Room. The kitchen (named after the creator of Rosa's and Taco Villa) will be used to educate the public on how to prepare healthy meals. 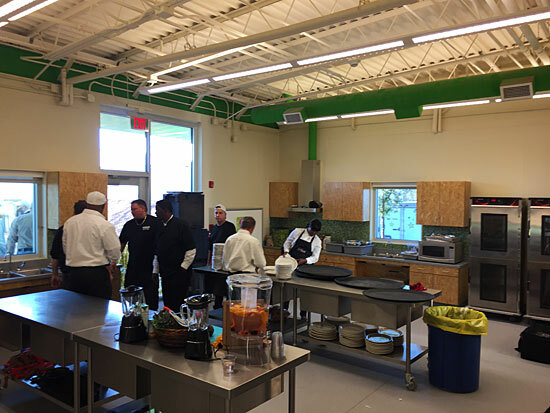 It has four cooking stations, and will be available to other collaborative agencies for cooking and nutrition classes. The training room has audio-visual capabilities and will also be made available to area groups for meetings and training opportunities. The exterior features of the facility are as impressive as the interior. 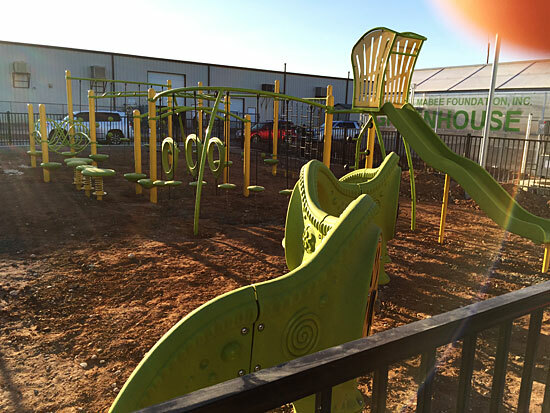 There's a great playground (the Miles & Laurie Boldrick Playground) to entertain children while their adults are shopping or learning. And, in case you're wondering, there will eventually be grass on that playground (this is a REALLY new facility!). And, yes, that is my thumb in the upper right corner. Don't say I didn't warn you. In the background of the preceding photo, you can see part of one of the two greenhouses at the site, named in honor of the J.E. & L.E. Mabee Foundation. 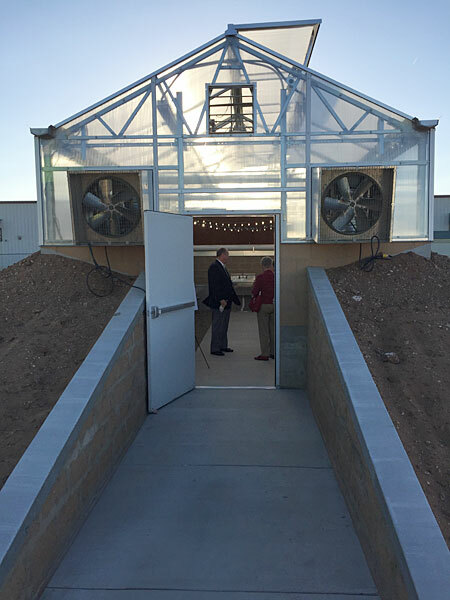 These state-of-the-art greenhouses will be managed by the Permian Basin Master Gardeners, and will be used to educate the public about gardening, composting, etc. 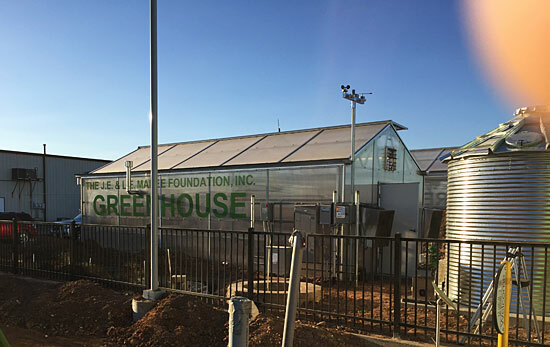 The two greenhouses are configured differently, with one being a "Chinese-style" greenhouse surrounded by earthen berms, and the other being a more typical West Texas greenhouse. 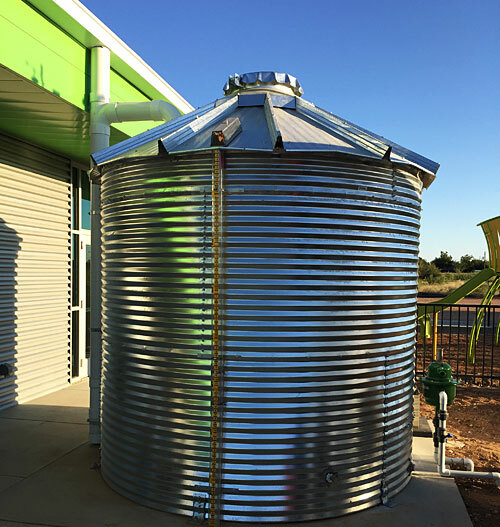 Both will be served by a 5,000 gallon rainwater collection system tied to the guttering on the main building. 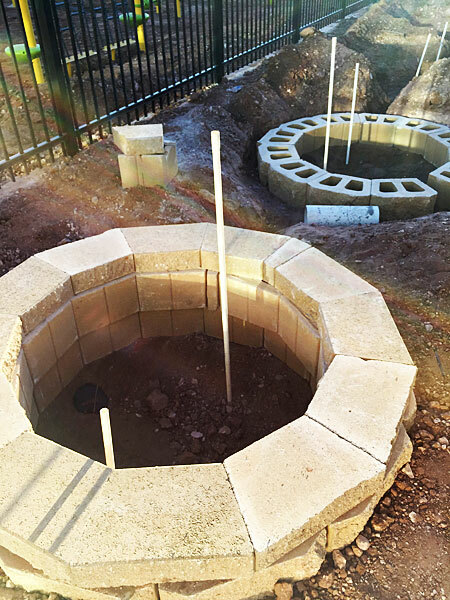 There will also be an area where children can plant and tend to their own gardens (still under construction as shown below). The entire facility, designed by the Parkhill, Smith & Cooper, is environmentally friendly. It will eventually be equipped with a 75kW photovoltaic solar panel system that will provide up to more than 100% of the location's electrical needs (putting electricity back into the grid during the spring and fall). The building material incorporated reclaimed materials (such as the pallets I mentioned above, as well as 50 gallon drums used as light fixtures). And, finally, the polished concrete floors in the lobby contain recycled glass aggregate, and the flooring in the training room is 100% recycled compressed aspen wood. The West Texas Food Bank is a critical asset in our region, serving millions of meals to hungry people in 19 counties across the 34,000 square miles it serves. I can't think of a more deserving recipient of your philanthropy, if you have the financial resources to share. This page contains a single entry by Eric published on October 21, 2016 10:47 AM. Atlantic Richfield's Corporate Art Collection - An Insider Look[back] was the previous entry in this blog. Coincidence? That's nuts! is the next entry in this blog.